"say It With Music"": Irving Berlin Is Honored At The Music Box Theatre"
More than 73 years after he built the Music Box Theater with producer Sam H. Harris, Irving Berlin's role in theatre's history has been commemorated there with the installation of a plaque and permanent exhibit. Berlin was involved in the running of the Music Box from its inception in 1921 until his death in 1989. After his death, his daughters - Mary Ellin Barrett, Linda Emmet and Elizabeth Peters - sought to preserve Berlin's link to the Music Box, and discussed their options with Gerald Schoenfeld and Bernard B. Jacobs, Chairman and President respectively of The Shubert Organization, which co-owns the Music Box with the Berlin estate. Renaming the theatre in honor of Irving Berlin had been suggested to the composer himself many times - an idea he always resisted (""It would have been too much Berlin,"" he once said.) Instead, the Berlin family commissioned the creation of a bronze plaque that now resides permanently in the street-level public lobby of the theatre. Modelled by the distinguished American sculptor Neil Estern, the image of Irving Berlin in profile was cast in bronze at the Tallix Arts Foundry in Beacon, New York. In addition to the plaque, a permanent exhibit covering Irving Berlin's Music Box years has been installed in the theatre's lower lobby, and is available for viewing by all ticket holders of the Music Box. The exhibit, comprised of two collage murals each eight feet by five feet, was designed by Drama Desk Award winning graphic artist Frank ""Fraver"" Verlizzo. Through a swirl of vintage photographs, newspaper clippings, sheet music covers and costume sketches, the panels convey the history of the founding of the Music Box Theatre in 1921, and the five Berlin musicals that premiered there: the MUSIC BOX REVUES presented annually from 1921 to 1924, and the landmark revue, AS THOUSANDS CHEER (1933), written by Berlin and Moss Hart. As told in the exhibit, the story behind the Music Box Theatre is one of risk, dedication and resulting success. In the late 'teens Irving Berlin, already renowned as the songwriter of ""Alexander's Ragtime Band"" and other popular hits, remarked to his friend, the producer and theater owner Sam H. Harris, that ""The Music Box"" would make a great name for a theater. ""One year later,"" Berlin recalled in a New York Times interview, ""I went up to Sam's office and he said, 'I bought 100 feet of Astor property on 45th Street. You're my partner.'"" Tributes to its rich past, and hopes for a bright future were in abundance at the dedication ceremony for the Berlin plaque and exhibit, given by his daughters at the Music Box this past December. Among the speakers were Ted Chapin of this organization, the three Berlin daughters, and special guest Kitty Carlisle Hart, who reflected on the friendship her husband Moss Hart had with Irving Berlin, and their shared triumphs at the Music Box. Mary Cleere Haran performed two Berlin numbers - ""Pack Up Your Sins and Go To The Devil"" (from THE MUSIC BOX REVUE OF 1922), and ""What'll I Do?,"" written in 1924 and interpolated soon after into that year's MUSIC BOX REVUE. Designed by architects C. Howard Crane and E. George Kiehler, the Music Box Theatre opened on September 22, 1921. At the time, it was flanked by a row of tenement houses and the Klaw Theatre, all now long gone. The property had cost $330,000; the building of the theatre another $947,000. Since Harris' concept had been to build a theatre with Irving Berlin as a home for Irving Berlin musicals, the first tenant at the Music Box was the very lavish, very grand yet still very intimate Berlin-scored MUSIC BOX REVUE OF 1921. Produced at the staggering cost of $188,000, more than triple the budget of the average musical of its day, THE MUSIC BOX REVUE posted a record-high ticket price of $5.50. The odds against Messrs. Harris & Berlin were enormous, and the street-corner pundits predicted disaster. What a surprise; the pundits were wrong. The first edition of THE MUSIC BOX REVUE was a smash. So was the second. And the third. And the fourth. With sumptuous budgets, lavish costumes and stage effects, the MUSIC BOX REVUES shared definable traits with the theatre that housed them: elegance, intimacy and class. Fanny Brice, Bobby Clark, Grace Moore, Claire Luce, William Gaxton and Robert Benchley were among the stars who took part in the Revues. Berlin himself appeared in the first edition (and was, he later recalled, ""a bit of a ham."") He wrote a seemingly endless cavalcade of novelty songs, ballads and production numbers for each offering, and keyed the entire series to a song written for the very first revue: ""Say It With Music."" Eventually the yearly grind of producing a new revue every season took its toll, and the Music Box began accepting other tenants. 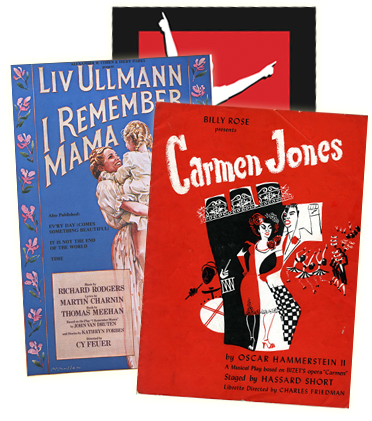 But in 1933, Berlin returned to the Music Box with what many consider the greatest example of the revue genre: AS THOUSANDS CHEER. Written with Moss Hart, AS THOUSANDS CHEER managed to put a brave face on the Depression with its sketches and songs plucked from newspaper headlines of the day. AS THOUSANDS CHEER starred Marilyn Miller, Ethel Waters, Clifton Webb and Helen Broderick and its score introduced ""Harlem on My Mind,"" ""Heat Wave,"" ""Easter Parade"" and ""Supper Time."" In her new book, Irving Berlin: A Daughter's Memoir (see HAPPY TALK, Vol. II, No. 1), Mary Ellin Barrett recalls her first visit to the Music Box - to attend a performance of AS THOUSANDS CHEER when she was seven years old, escorted by her father, the composer: ""If I didn't understand completely that the dark, dapper man beside me had written all those songs...I understood enough; and even more when we went backstage and were surrounded by [the children in the cast], some of them not much older than I...And he was suddenly part of it, back there in his natural habitat."" Barrett remembers that visit to the Music Box as a milestone in her young life: ""So I had a glimpse of my father in his world, that mysterious world beyond the limits of my horizon. A glimpse of glory."" For more than seven decades the Music Box has flourished as one of Broadway's most sought-after houses, providing a home to such landmark productions as OF THEE I SING, ONCE IN A LIFETIME, THE MAN WHO CAME TO DINNER, I REMEMBER MAMA, PICNIC, FIVE FINGER EXERCISE, SLEUTH, DEATHTRAP, SIDE BY SIDE BY SONDHEIM, AGNES OF GOD, A FEW GOOD MEN and, most recently, the hit musical BLOOD BROTHERS. ""Throughout his life my father had a deep attachment for the Music Box,"" said Linda Emmet in her remarks. ""Of all the honors he has received since he died, I believe this is the one that would have pleased him the most."""